Comite Noviembre celebrates its annual Puerto Rican Artisans Fair & Exhibit in the Bronx on Saturday, Nov. 20th. Free event. Master percussionist Obanilu Allende and the son of world renowned singer Danny Rivera, Daniel Rivera, Jr. will perform. 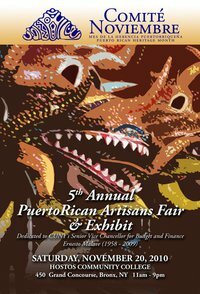 The Puerto Rican Artisan Fair & Exhibit was established in 2006, in celebration of ComitÃ© Noviembre’s, 20th anniversary. Over 40 artesanos puertorriqueÃ±os from throughout the US and Puerto Rico participated and the event boasted an attendance of over 5000 people in this very first Fair. Last year’s Fair continued to exceed CN’s expectations with over 60 artisans participating and a steady 5000 people. â€¢ Master percussionist Obanilu Allende and the son of world renowned singer Danny Rivera, Daniel Rivera, Jr.
For the past four years, CN has transformed, Hunter College West Building and the Church of St. Paul the Apostle into a typical Puerto Rican plaza with a fountain, palm trees, piragua and coquito carts and artists, sculptors, vejigante mask makers promoting and selling their wares while musical and cultural acts entertained throughout the day. This year will be no different at Hostos. CN will also continue to conduct cultural workshops for children and adults, like mask making, the history of the three kingsâ€™ celebration, TaÃ­no storytelling in order to make sure that our youth learn about our culture. This free fair is an opportunity to kick-off the holiday shopping season by supporting our artesanos. For more information visit us online at: ComiteNoviembre.org. If you are on Twitter, follow us @comitenoviembre.